How to Succeed with a Second Nonfiction Book Project - Write Nonfiction NOW! You’ve put your first big nonfiction book project to bed. What’s next? 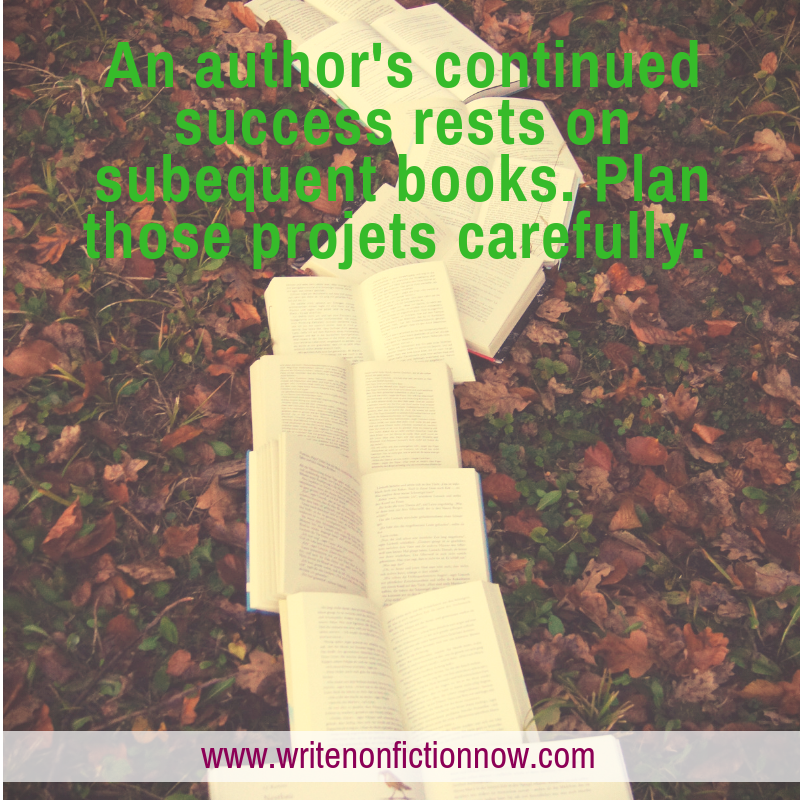 And how will you approach the second book project so it succeeds and you advance your nonfiction writing career? Good questions. Today, book editor C.K. Bush (@theladyck) answers them based on her experience with long-time editing clients. One of the greatest pleasures of my work as an editor is receiving a new project from an author with whom I’ve previously worked. At that moment, I’ve gone from being their editor on one project to their editor. Period. We now have an ongoing relationship, one that speaks to a mutual trust and confidence in each other’s work. In my profession, those relationships are the ones we cherish. When the second nonfiction book project comes around, though, there are a host of new challenges. As someone’s dedicated editor, I try to use the ongoing relationship as an opportunity to help an author navigate these issues. A first major writing project is passionately conceived and often close to the author’s heart; after all, the prospect of writing it is what compelled the author to become an author in the first place. In writing a second big piece, the how—and when—to write it isn’t necessarily the same. The reception of the first piece, the author’s career choices, and the demands of taking on something new after so much time spent on the first topic all complicate getting started on this new writing project. Let’s walk through the common issues that my nonfiction authors face when getting ready to write their second big nonfiction book project. Overcoming them can feel hard, but it’s not impossible. And the solutions to these issues are more straightforward than you might think. In writing a second big piece, the how—and when—to write it isn’t necessarily the same. #1: I need to write something now! When an author’s living depends on writing, she wants a steady stream of projects to keep her income as constant as possible. Most of the nonfiction authors I work with have a combination of types of writing going at one time—a book for me, an article for someone else, an op-ed for a major newspaper, and so on. They are not entirely dependent on immediately churning out a new book. Still, I sometimes see authors who are in desperate need to get a new book project underway for career advancement or financial reasons. This rush to get cracking on the next project predictably leads to undercooked books, such as ones with unclear theses or disorganized chapters. I almost always need to kick back these proposals to their authors so we can get them to a place where I feel comfortable discussing them with my colleagues as potential new publications. It’s important to never let panic override your best instincts when developing the ideas for your next nonfiction book project. You might not have the same deep burst of inspiration as you did for the first project, but you shouldn’t rush out with the first thing that pops into your head. Take a break and think deeply. Allowing more time in the beginning will help the rest of the process move faster in the long run. You won’t need to do as many revisions and reconsiderations midway through to get your work ready for publication. Never let panic override your best instincts when developing your next nonfiction book project. #2: Why reinvent the wheel? If an author’s first big nonfiction project has been well-received by critics, in book sales, or in social media buzz, often they have an impulse to continue working on the same topic. This is logical—after all, the author has hit on something interesting and developed the necessary expertise to do so. But, this approach can also lead to the author getting into a rut that they don’t necessarily see coming until its too late. Some authors, trying to turn out a new nonfiction project quickly (as in scenario #1 above), may work to repackage a previously successful set of research into something that seems new. This almost never works—readers, reviewers, and publishers alike can tell that the author’s latest project isn’t actually a fresh take on the topic. Becoming an expert writer on a given topic with a suite of interesting publications takes time and effort. Re-writing essentially the same work over and over again is not a shortcut to this success. I often push nonfiction authors to go back to their original work and think about the “so what” they never considered and use this unanswered question as the jumping off point for new but related work. A writer might not want to reinvent the wheel, but they ultimately have to do some reinvention to continue to produce quality work. Re-writing essentially the same work over and over again is not a shortcut to success. #3: I need to completely reinvent the wheel! Other times, I run into an opposite problem from returning nonfiction authors: they want to write their next book on an entirely new topic. Professionally, this may be a gamble—if Ronan Farrow, for instance, switched to only writing restaurant reviews, readers who chose to follow his work for its investigative or political reporting would probably stop seeking out his work. Making a drastic switch in topics also can waste the rich body of expertise a writer has developed. Sometimes the author is not able to develop as good of a sense of expertise on this new topic area. When an author approaches me with a project that represents a significant shift in what he or she is known for, I counsel them to think carefully about this change. Is there a way to link the next book project to your existing expertise? A change in an author’s field of study demonstrates versatility and an ability to take on an intellectual challenge, but a body of work with clear connections and consistent quality of depth and care ultimately does a much better job of reflecting a writers’ true intellectual growth and skill. Making a drastic switch in topics can waste the rich body of expertise a writer has developed. When it’s time for a second project, professional and economic realities are a factor in the writer’s process—maybe more today than ever before. From my editorial point of view, the trick lies in an author’s ability to learn how to balance these realities with the writing process itself. That process contains all the same inherent challenges as it did when the writer worked on the first big project. It’s important not to let the new realities of continuing to be a writer get in the way of the most important thing of all—the creation of a high-quality piece of writing. What’s your second-book-project strategy? Tell me in a comment below.